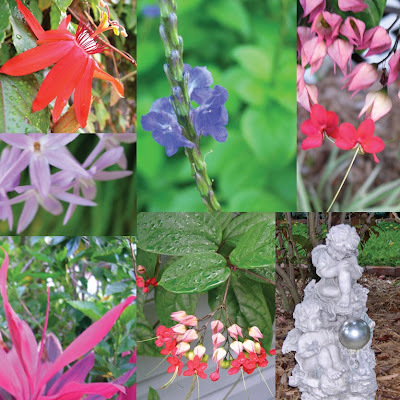 I am very excited about today's posting, because I get to tell you about one of my favorite places here in Florida. If you've every thought about vacationing on the Gulf Coast, you must come to Dunedin. 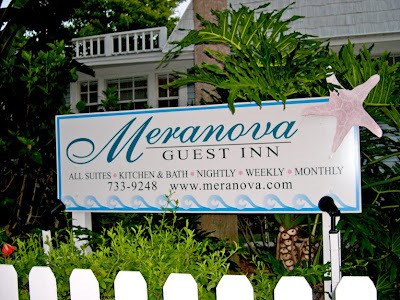 AND, if you come to Dunedin , you must stay at the Meranova Guest Inn! Built in 1907, the Meranova is a fully-restored Victorian Saltbox and Carriage House that now is the most fabulous bed and breakfast on the planet. 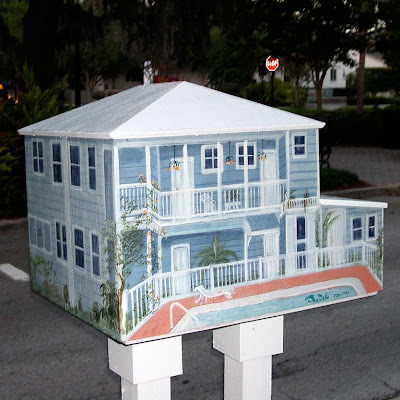 How cute is this mailbox? Upon arrival I was greeted by Frank, who escorted me to my California Mission-style cottage where brandy had been poured and a chocolate truffle waited to be devoured. 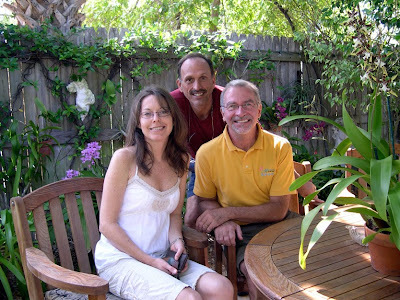 As Frank gave me the tour, my friend Liz arrived and we were amazed at how beautiful our "home away from home" was. The Meranova far exceeded our expectations in charm and elegance. Every detail had been addressed and our cottage was immaculate! Coffee was ready to be brewed at the touch of a button, filtered water chilled in the fridge, homemade brownies were calling my name, city maps and local brochures waited to be perused, the pool was warmed to 87 degrees, and the gardens beckoned with their beauty. I instantly felt the tension in my overworked body subside as I happily drifted into the world of Meranova. Feeling no great urgency to leave this fabulous environment, we left the unpacking for later and explored just outside our door. From our private patio we hesitated just long enough to figure out which way to venture to take in the splendor of the gardens, the draw of the gazebo made it easy. 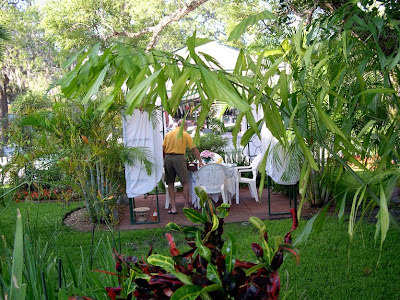 The gazebo is enchanting, as is the seating under a huge shade tree. 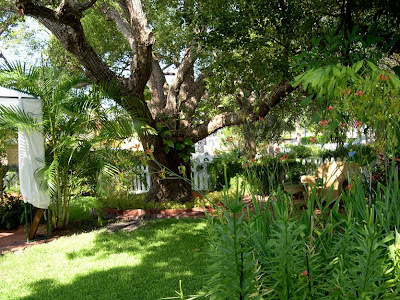 The landscaping invites you to turn every corner and explore every nook and cranny to see what surprises are awaiting discovery. David has created a masterpiece that rivals most botanical gardens! 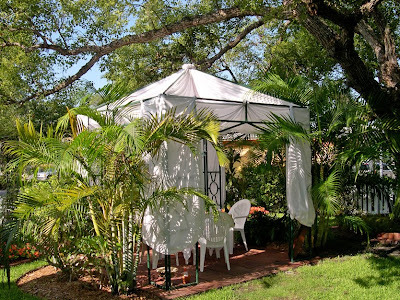 Breakfast is served each morning where you desire – your room, your patio, the orchid garden, the big Southern-style front porch or the gazebo. We chose the gazebo and were not disappointed. Frank and David went out of their way to fulfill our request for one vegetarian and one vegan meal. Each morning started with perfectly brewed coffee, fresh squeezed orange juice, soy yogurt, fresh fruit and an assortment of delicious grain breads. As the vegetarian, I found the Scrambled Eggs with Summer Salsa delicious and the Putanesca with Shirred Eggs was scrumptious! We decided to call this our "First Annual…, then decided on bi-annual, but even that's too far away! This is heaven! You can tell that I fell in love with the Meranova, as well as, Frank and David. You should know that the inn is not a family getaway spot. 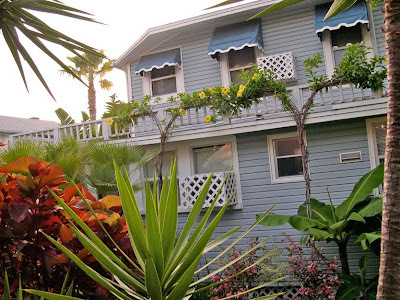 This spot is perfect for honeymoons, romantic getaways and girlfriend vacations. Sorry, if this offends those with children, but I loved being able to relax without the sounds of children running outside my door and playing (screaming) in the pool. There are plenty of places to take the kiddies and we need somewhere to relax and unwind. The Meranova has been featured in both Southern Living and Coastal Living magazines and was awarded "Best Walking Town" by The Walking Magazine and came in #1 for "America's Most Walkable Cities" in the Small Communities (population less than 50,000). "Do you ever walk to the local bookstore or ice cream shop on a whim? Could you? There was a time, not too long ago, when it was easy for most people to get to a corner store for a quick-fix of Chaucer or cappuccino chip. Homes were close to "Mom & Pop" stores, and traffic moved at a gentle pace over quiet streets. But over the years it's become more and more challenging to get around on foot." There is plenty to do in Dunedin! 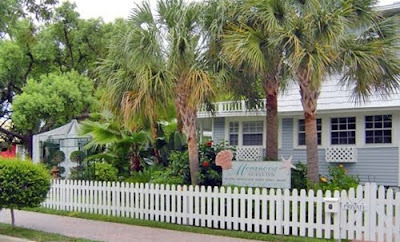 Honeymoon Island and the Dunedin Causeway are only minutes away from downtown shopping and dining. 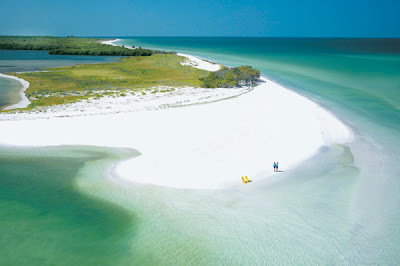 Accessible only by boat or ferry from Honeymoon Island, Caladesi Island was named America's No. 2 beach in 2006 and 2007; in 2008, it received top billing. A state recreation area suited for swimming, shelling, fishing, picnics and nature study. 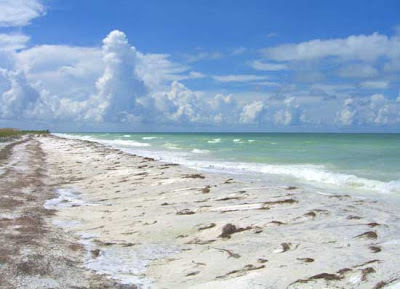 Like Caladesi Island, Honeymoon Island is one of the state's pristine barrier islands. 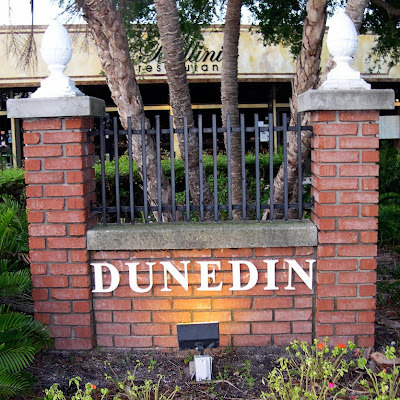 Dunedin is a people friendly community full of parks and recreation, offering an abundance of outdoor fun and excitement for everyone. The 34-mile long Pinellas Trail runs through downtown and Main Street ends at the marina and adjacent waterfront walkway, just five short blocks from the Meranova. Note that the waterfront in not a beach, you must make the short drive to Honeymoon Island to hit the sand. Clearwater Beach is only about 10 minutes away in the other direction. So, if your looking for a place to escape the cold this winter, make a reservation at the inn. Oh, and be sure to tell the guys I said hello! You may just see me tooling around town, after all, Dunedin is only a short drive from my house and one of my closest friends lives just off the trail. Hope to see you there! 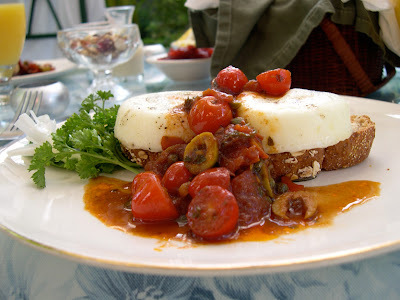 BTW, last Friday I posted my version of Shirred Eggs with Puttanesca for Foodie Friday. 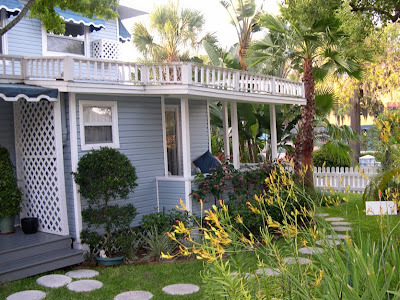 Now before you pack your bags and head to the airport, be sure to stop by Susan's at A Southern Daydreamer for links to more Outdoor Wednesday posts and Barbara's at The Book Blog for links to more Waterside Wednesday posts. 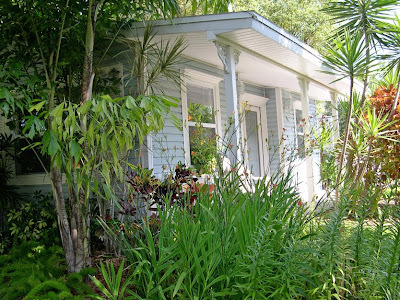 Check out her book Waterside Cottages while your there! Update: I just dropped in to see what a fellow Floridian and blogger had posted and was pleased to see it was on Honeymoon Island! Jane lives very close to Dunedin, even closer than myself, so to see some great photos and meet her dog, Rowdy, visit her lovely blog Artfully Graced. Hi Rhonda. Wow such a great place. Thanks for sharing. Looks like a very relaxing and beautiful place! Appears to be another spot of great tranquility. Even photos of spots like this touch a special place in my spirit. Cris, you are so sweet, I'm going to check out your blog right now. BTW, Dunedin is the Scottish town here and a very short distance away is Tarpon Springs, the Greek town. Sponge docks, great food and more great shopping! Kathy, you guys should definitely check this place out when you can. I can't tell you how wonderful and charming it is. Oh, I will, I will. It looks great..., and that breakfast salsa, oh my gosh! I'm usually a coffee and whole wheat toast kind of girl (or bagels), but I'd gladly make an exception for that. And on another note..., I'd love to make a Sailors Valentine..., but know that I probably never will. Funny hey..., but the thought feels good. I loved your post on Meranova, It is the perfect place to reconnect with your special someone...even if it's your girlfriends. Come to think of it, with girlfriends, there is a lot more shopping! and I love shopping in Dunedin! As your articles say, there are wonderful restaurants within walking distance...and don't forget Strachan's for ice cream with "yummy yummy" sauce. Frank and David are delightful! 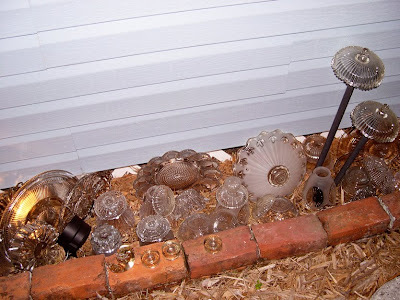 The glass garden was new to me...and a great way to use those mismatched punch cups and plates! 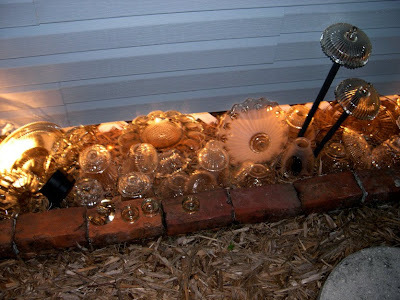 I may have to try this...after I get my wine bottle border in. I just showed Hub and said "We have to go and stay there" The glass garden is such a great idea. I would just love to sit in that gazebo. I was trying to see how they put down the tiles..because I am thinking about something similar.. The gazebo does look enchanting! What an amazing place. 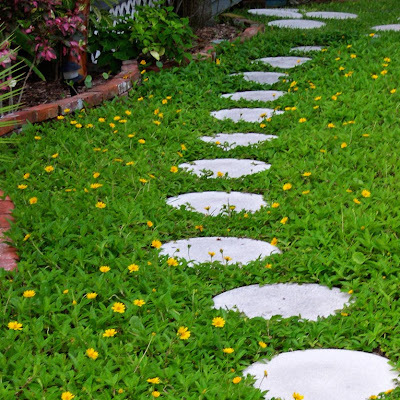 The stepping stone path with tiny yellow flowers is so cool looking. I love the beach shots too. Dreaming I was there right now. I'll tell you one thing if I was going there, the first thing I would want to know is when is breakfast?! Maya, I'm with you, my breakfast is usually yogurt, fruit and grain bread toast. Frank just spoils me with his cooking skills. I wish I could find a miniature sailor's valentine base, then I wouldn't be so intimidated. Jane, yes! Shopping in Dunedin is so wonderful and girlfriends will always shop all day with me. Strachan's? Definitely! I'm so glad you met Frank and David and I can't wait to see your wine bottle border. Hugs back to you. Sue, I'll go over next week and take some closer shots of the tiles in the gazebo and get some instructions from Frank. He's so good at this stuff! Meg, my little ray of sunshine, you always say just the right thing. I'm glad you like the tiny yellow flowers in the ground cover. I'm trying to convince my sister that we should pull out all our grass and do this. 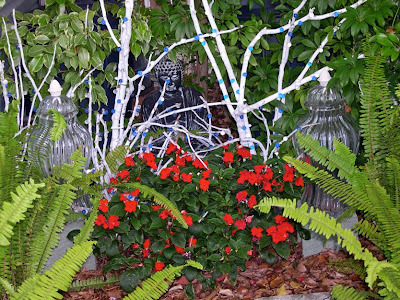 It is much more drought-tolerant and looks so darn pretty. BTW, I loved the comment about the cake you left today on Ocean Dreams blog, just cracked me up! Fabulous photos. It looks like it is a great place to visit. I love the photo of the mailbox, how cute is that. That place look wonderful! I imagined myself sitting in the gazebo waiting for my breakfast. I'm usually in central FL seeing family... but I'm tempted to sneak away. Hi Rhonda, I am enjoying your getaway!, A great place. I've read about Honeymoon Island in one of the blogs in OW. Great post! Thank you for sharing this sweet little place. Just my style... now bookmarked. If only our side of the Gulf was as charming as yours. Thanks for sharing this beautiful spot with us. Your photos are just terrific. I hope you are having a wonderful day. 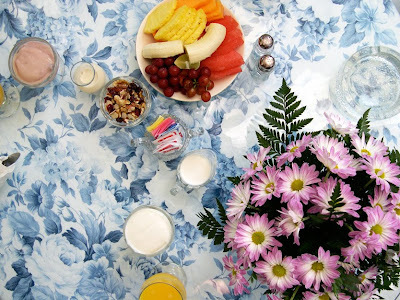 Such a charming place and those breakfast looks divine..
What an amazing post! I would so love to visit this wonderful place, I have never been to Florida, it is a long way away from Canada. But, if we ever do go, I will see if we can't stay in this little piece of heaven! hugs, Cindy S PS Thank you so much for your sweet comment on my blog, you are so right, father's are very, very important in a childs life. Thankfully my grandkids have wonderful dads and moms. Hi Rhonda! This is a beautiful place and I would love to go there. Thanks for sharing the beautifulness. I think I am in love with Meranova too, I can understand why you like it so much! The botanical gardens look enchanting and that food looks delicious! Hope you have a lovely day, I love your beachy blog too! I may have to check this out--We are stuck in the Destin rut! We do love Destin, but it has gotten so large and the traffic is horrendous in the busy season. Thanks for the tour and pictures! Fantastic post Rhonda!!! Wow...the Meranova looks so charming! 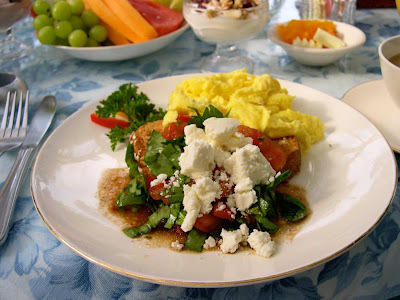 And I can't get over how amazing that breakfast with the eggs and salsa looked, feta? YUM!!!! I love all the photos! 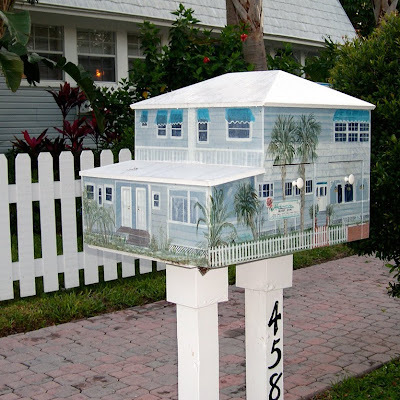 The mailbox is adorable! I have to say that photo of Caledesi Island is amazing...I couldn't get over the clouds in the sky! Thank you! looks magical. and those eggs putanesca had me at hello. delicious! I'd say you gave this a rave review ... and a well-deserved one! Thanks for sharing what must have been a fantastic time! Your photographs are amazing! Just beautiful! What a wonderful place to visit. Thanks for sharing it with us. I live not far from Dunedin...it is a charming place to visit. Completely walkeable (or bikeable). I would recommend anyone who goes to walk down to the Dunedin marina at sunset - there is usually a small crowd gathered to wave goodnight to the sun.